A few weeks ago, I had another sleepless night. Imagine that, a 54 year old widow, alone in her country home, not getting a wink – too hot, too worried about the election, with a cat trying to sleep in her face. As if writing research reports about consumer products and substitute teaching at the local 100% free lunch high school wasn’t enough, I had managed to say yes to yet another task. 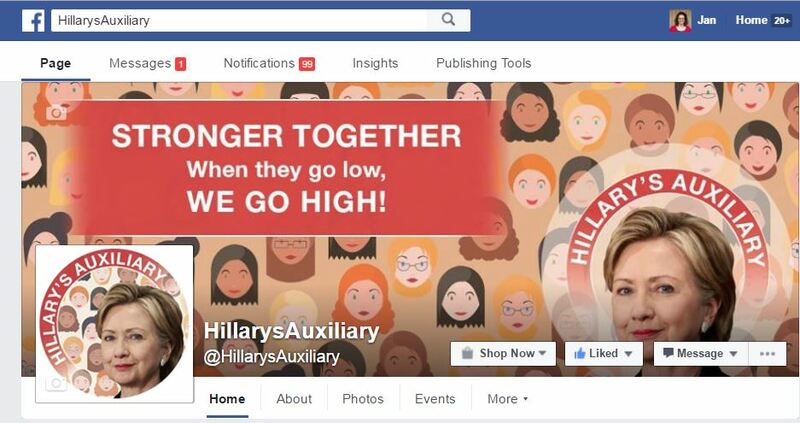 I have been following the Facebook site Hillary’s Auxiliary for the past few months as part of my recovery plan from my brief political affair with Bernie Sanders, that left me feeling a little lost and ashamed. My intentions were the best, he was tall, older, outspoken and exciting. And he spoke about the “economy!” Since my late husband was an economist, it only seemed reasonable for me to take up with this man. After all Hillary was just Hillary, I knew her, and really, a woman? What’s so special about that? There are plenty of “us women” in my red state hell. And to top it off, my neighbor’s swell husband talked to me about Bernie, and he said we would be a good fit. My sleepless night saga began when Jan Lisa Huttner messaged me, asking if I could watch her Hillary’s Auxiliary site while she went on vacation. She said it would be simple, troll-banning (Jan calls it “vacuuming”), and a posting a few articles. She sent me a screen shot of a troll post and showed me what to do. It seemed easy enough, after all, I had hunted jack rabbits while spending my formative years on a Wyoming ranch. Jack rabbits eat the grass that the cows and sheep need, so we kept the population down, sold the pelts, and ate a lot of rabbit stew. Simply pushing a button with no follow up work seemed easy when it came to getting rid of a troll on a Facebook page; very modern and civilized. With Jan’s no trolling policy, it would be a snap to scan the page looking for buzz words like “witch,” “liar,” and “Killary” (among other hateful words about HRC). Male trolls in this political realm are fairly predictable, kind of like the rabbits, they stop, eat a bite of grass, defecate, and hop off. Trolls leave little pellets of poison that seem to come from Donald’s rally speeches, and then they jump to another pro Hillary page to spread their hate. In hunting them, I not only scanned the page for hateful words, but looked for the names of very young or very old men who had some serious axe-grinding to accomplish. Many of them reminded me of my Uncle Ben Ghazi, who haunts my page daily, screaming in all caps about anything I post about HRC. The second part of my Hillary’s Auxiliary saga was the hardest part. I had the task of posting intelligent, tasteful and fresh things about Hillary, which were relevant in the day’s news, and provided some relief and substance among the daily onslaught of torture from the media (not to mention from Trump). Now I really regretted my recent past of ignoring her campaign in order to focus on Bernie, as well as my bad attitude about her in the distant past. While my family reaped the rewards of the Bill Clinton economy, we were not very appreciative in our red state hell. The media was editing news clips back then too, and I was horribly offended about her “I suppose I could have stayed home and baked cookies and had teas” statement, because I was not privy to the second part of the statement where she said; “but what I decided to do was to fulfill my profession which I entered before my husband was in public life.” At that time, I was at home with a baby girl, baking cookies, and living a life of relative ease, because in the Clinton economy, one income was enough for us to be more than comfortable. Going forward with the pain and regret of my past treatment of Hillary, my deep dive began in trying to find good and relevant articles to share. Google searching, checking my pro Hillary friend’s pages, and trying desperately not to share something another page had already shared, was indeed a challenge. As a teacher, I wanted the audience to gain perspective and some historical sense of Hillary’s campaign to go along with the current news. At times my desire to lighten the mood from the dark times of the campaign led me to share humorous videos by Trae Crowder or Randy Rainbow, which caused an audible internet sigh, or stunned laughter from the Hillary’s Auxiliary audience (who are accustomed to more serious articles). My efforts to be more inclusive by featuring the “Ragin Cajun” James Carville, and our Democratic heroine Donna Brazile, were welcomed wholeheartedly. The Hillary’s Auxiliary fan comments seemed to sum up the yearning I have had to better understand what it will mean to have Hillary Clinton as our new president. Thank you, Jan, for giving me this wonderfully enlightening experience, and thank you Hillary’s Auxiliary fans for putting up with this widow from the American countryside while Jan was away. Dani d’Arge is a part-time research analyst and substitute teacher who owns and operates Lone Prairie farm near Paris (KY). She has faced many challenges after becoming a widow seven years ago, hitting the restart button on her life without sacrificing her past. Dani has an adult daughter, and enjoys a peaceful life with her horses, rescue dogs, and cats, along with her quilt making hobby.